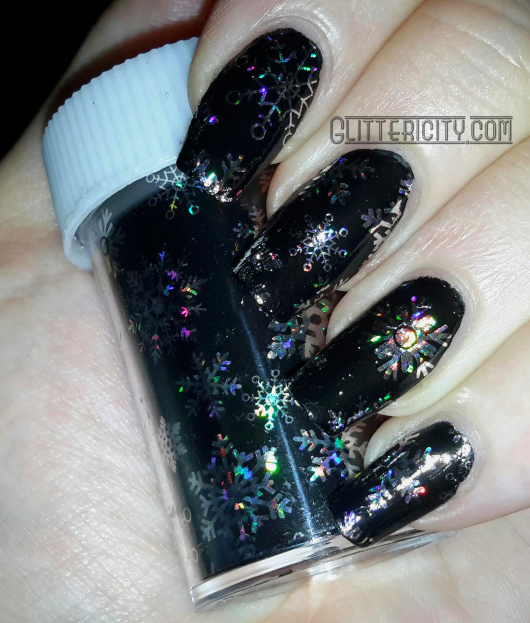 Glittericity: Born Pretty Store Review | Holographic Snowflake Foil! 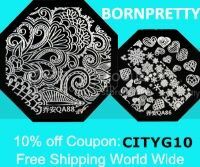 Born Pretty Store Review | Holographic Snowflake Foil! Hello lovely people! Look at this gorgeous foil from Born Pretty Store. 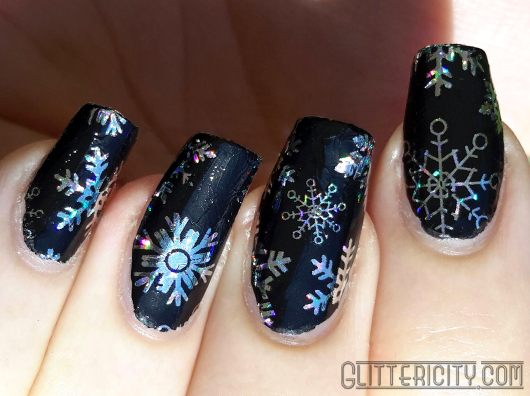 It has holographic silver snowflakes on it! You guys know that holo is my favourite colour, right? :D Click to see more! 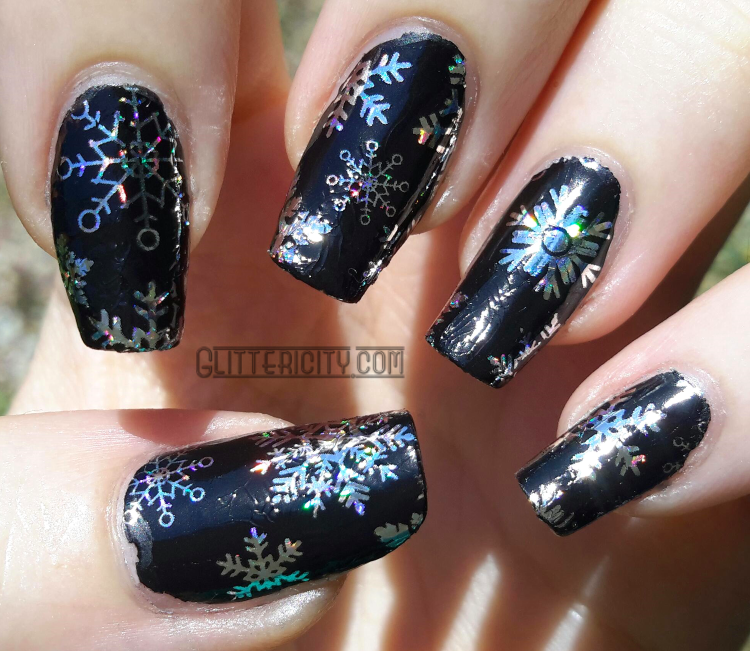 This is 100cm of shiny black foil covered with awesome silver holo snowflakes! 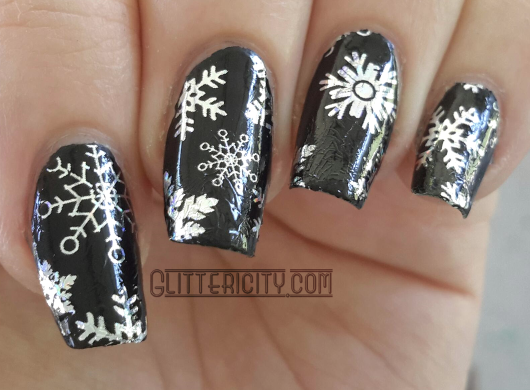 I love snowflakes, and I love silver, and I love holo, and basically this is the most awesome foil ever. This stuff was SO easy to use. I think it's the most cooperative foil I've ever used. I painted my nails black first, so any missed spots wouldn't show up. This turned out to be unnecessary, since the foil behaved just perfectly. Once my foil glue dried, I was able to effortlessly apply this prettiness all up in here. SO SHINY! I topcoated with Picture Polish Revolution, their water-based glitter basecoat/foil topcoat. It worked pretty well, and only made it wrinkle a little--which may have been my fault for not smoothing the foil out enough first. It isn't too noticeable most of the time, and I got tons of compliments on these nails at work. It even wore really well, which is something I've never experienced with a foil before! I don't know if it's the type of foil or the topcoat I used, but I'm thrilled with the four days I got out of this mani.